I have always known I was related to the founder of Tottenham Hotspur's. He is 85 and has supported Tottenham all his life. He didn't know who in his family it was, just that it was a "Ripsher". He also told me that Tottenham started out as a cricket team. When I began researching my family tree this was someone I had to learn more about. After a lot of research I found John Ripsher. He was born in London in 1840 and was the third son of Henry Ripsher, a railway clerk. He was my 1st cousin 5 times removed (that is the number of generations between us) my dad is therefore 4 times removed. 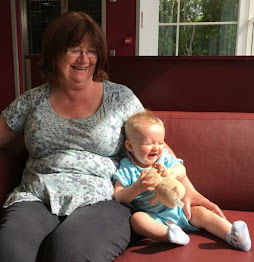 John was the bible class teacher at All Hallows Church, Tottenham’s parish church. The local boys had formed a cricket team that kept them out of trouble in the summer but had nothing to do in the winter so in 1882 they decided to form a football team and played on Tottenham marshes. They were frequently bullied and had no money for kit or footballs so they asked John to help them. They called the team Tottenham Hotspur after Sir Henry Percy, known as Hotspur for his valour and courage in battle. The Percy family owned land in Tottenham. From what I've read John was very strict and expected good behaviour and fairness from the boys. In return he stood by them when they got drunk or played cards in church. He nurtured and coached them. He found them changing rooms and a hut for their HQ. He provided them with footballs. They soon returned his kindness with respect. Tottenham Hotspur won their first game 9 goals to nil. They were so successful that by the end of their first season they had a reserve team as well as their first team. John Ripsher was their elected president for 11 years. The club was known for it's fairplay and sportmanship, it was said to be down to John's leadership. 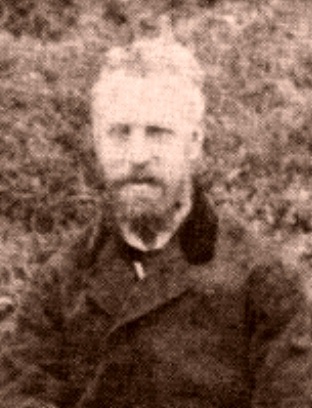 John left Tottenham in 1894 to live with his sister in Dover. His fortunes declined along with his health. He had heart problems and ended up blind and penniless. He died in the workhouse on 24th September 1907, he was 67. He was buried in an unmarked paupers grave. 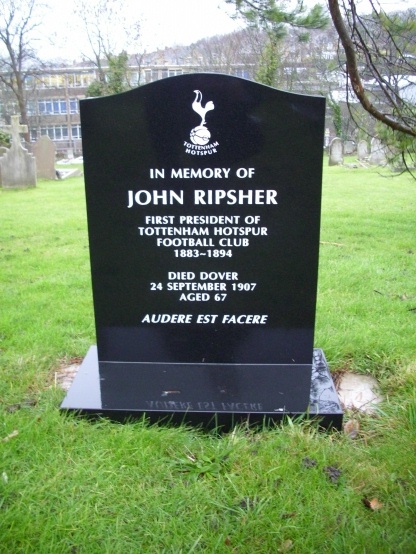 Peter Lupson found his grave and with Tottenham Hotspurs and their fans support a headstone was purchased and erected in Dover for John. I too have always been a supporter of the best football club ever...Tottenham! I was hoping for Kings and Queens lol. Got paupers, oh and some black sheep too!